TALLINN, Estonia, March 25, 2019 /PRNewswire/ -- Estonia, one of the world's leading tech hubs, is running a global recruitment campaign until end of March to draw the world's top IT professionals to the country and match them with talent-hungry tech companies, such as Transferwise, Taxify, Veriff, Swedbank Estonia and many others. Already now, Estonia's capital Tallinn is home to the highest proportion of tech companies with valuations of over US$1 billion in per capita evaluation. Overall, there are currently around 550 startups in Estonia engaging in a variety of sectors ranging from FinTech to GreenTech and beyond. The start-up growth reached a significant milestone in 2018, with the number of start-up employees growing by 26 percent from 2017. "Do not be fooled by its small size; Estonia is well and truly embedded in the digital economy. The startup community in Estonia is tight-knit, offering tech professionals endless opportunities to bring their ideas to life, both on the local and international level," says Kaisa-Triin Kosenkranius, Head of Career Hunt project at Work in Estonia program. Data gathered by the Estonian Startup Leaders Club notes that startups in Estonia employ 581 people from abroad. And Estonia is ramping-up its drive to bring in more global tech talents to base themselves in Tallinn. 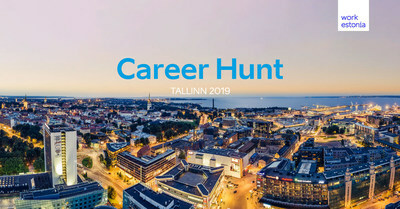 The Work in Estonia program – an initiative by Estonia's government – recently launched the second edition of its annual Career Hunt campaign. In a similar campaign conducted last year, 5,500 people from around the world applied for the opportunity to work in Estonia. For this year's campaign, Estonia is again welcoming tech specialists to apply for a life-changing job interview. Those who pass the initial screening rounds in their interviews will fly to Estonia for a five-day all-inclusive tech tour combined with exclusive VIP-shortcuts for job interviews. "Before the campaign, I only knew a little about Estonia itself. But the companies I met convinced me that's the place I was looking for," says Brazilian Luiz Felipe de Souza Gomes, alumni of the first Career Hunt who now lives and works in Tallinn. Maria de las Mercedes from Argentina, another participant from the first year's campaign admits: "The way that people work here and the way that the companies function here is very horizontal. You can reach anyone in the company." Fourteen Estonian IT industry heavyweights participate in this year's initiative to find and nurture more talent. The companies include Transferwise, Monese, Veriff, Starship Technologies, Pipedrive, Thorgate, Taxify, Malwarebytes, Finestmedia, Icefire, betPawa, Swedbank Estonia, Genius Sports Services Estonia and Mooncascade. Combining the massive growth in start-up funding – bolstered by the US$328 million in received investments last year – and number of tech employees, Estonia's start-up scene is now more vibrant than ever. Applications for Career Hunt 2019 are open online until 31st March 2019. Work in Estonia is a part of Enterprise Estonia – a national foundation to support entrepreneurship. The goal of Work in Estonia is to introduce Estonia as an attractive place to work and live to talented specialists worldwide. Estonia is competing with several European countries for tech talents in the information and communication technology sector and currently lacks 7,000 professionals.